Most people start noticing their third molars (wisdom teeth) when they reach their late teens or early twenties. The number of wisdom teeth varies from four to zero. In many cases, the developing tooth’s path of eruption is blocked (impacted) and it remains under the gum. The cause of impactions is due to the jaw size being too small to accommodate the tooth that can be partially or totally impacted under the gums or is positioned out of the tooth alignment. If the impacted tooth does not fully erupt it can cause additional problems than a fully erupted tooth. One or more of the problems listed below can occur with varying intensity at different times. Infection is the most common problem around the gums and the bone and can even extend onto the face and neck. These infections can affect the general health of the individual. It is also possible for the impacted tooth to cause crowding and damage to adjacent teeth. A more serious complication is when a sac develops around the impacted tooth and it fills with fluid and enlarges to form a cyst, which causes a hollowing out of the jaw, and can results in permanent damage to the adjacent teeth and jawbone. No one can predict if or when an impacted tooth will cause some or all of these problems, but problems could arise and complicate management. Therefore it is recommended if the impacted teeth are not removed that appropriate and regular radiographs be taken to determine if problems can occur now or in the near future. Removal of impacted tooth is easier in younger patients as roots are not yet fully developed and the bone is less dense. In older patients, removal before complications develop provides a quicker recovery and healing time and minimises the discomfort. The operation to remove an impacted tooth in soft tissue requires the gums to be cut and then the tooth can be removed. 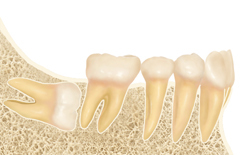 If the tooth has a bone impaction, then the adjacent bone must be removed around the impacted tooth. In difficult situations the tooth also has to be cut into pieces before it can be removed. Under special conditions the impacted tooth can be made to erupt but requires the patient to be young and the impacted tooth to be in a good position with the appropriate angulation. In certain situations if the adjacent tooth is removed the impacted tooth could erupt. In other situations all that is required is to surgically expose the tooth by removing the gums and in some cases also remove the adjacent bone. At times it may also require the impacted tooth to be loosened and in other situations orthodontic treatment is required to move the tooth into a useful position. Unfortunately this does not always occur and at times even if it erupts it might not be useful. In rare situations the impacted tooth can be surgically removed and then placed into a recently extracted tooth site and with additional treatment it could become a useful tooth. All these different managements of the impacted tooth are considered and will be based upon your general health, oral conditions and any other relevant factors. Then the best treatment will be presented to you for your consideration by the oral and maxillofacial surgeon.